CARBONDALE, Ill. — President emeritus of Bangkok University and former senator of Thailand Thanu Kulachol will receive an honorary degree from Southern Illinois University Carbondale on May 11 during the commencement ceremony. 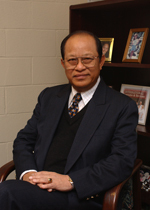 An international leader in education, Kulachol earned his Ph.D. in higher education from SIU in 1977, before returning to serve at Thailand’s oldest and largest private university, Bangkok University. In addition to his educational work, Kulachol also served on the Thai Senate and is currently on the boards of TPC Power Holding Public Co. and Thai Polycons PCL. Named president of Bangkok University in 1988, Kulachol spent 19 years building the 4,000-student college into a leading creative university in Thailand with international linkages and nearly 30,000 current students and over 200,000 graduates to date. Twice during his time as president, BU asked Kulachol to delay his retirement, giving him ample time to expand the international partnerships to include over 43 countries, along with establishing the International College Building Bangkok University Gallery and Surat Library. He received invitations twice to take part in the United Nation’s Secretary General’s Global Colloquium of University Presidents, sharing in the international discussion on higher education issues. Secretary General Kofi Annan handpicked twenty university presidents, with Kulachol and Bangkok University representing one of the five Asian countries chosen. While Kulachol was still serving as president in 1996, the Royal Command of His Majesty the King appointed him to the senate where he worked for four years to strengthen private education in Thailand. Dating back to his early years as a student, Kulachol’s passion has always revolved around education. After graduating with his bachelor’s degree from BU, he earned another degree from Farleigh Dickinson University before coming to SIU, where he completed his Ph.D. program in two years. Kulachol said his time at SIU prepared him for his illustrious career of service. To recognize his exceptional work as an international leader in higher education, Kulachol will receive an honorary doctor of education leadership during the commencement ceremony on May 11 at the SIU Arena. His wife Nongyao, his daughter Dear, his son-in-law Clint Rice and his two grandchildren, Tara and CJ, will join him in Carbondale for the event. “It is such a great honor and privilege to be recognized by SIU, which is one of the best universities in the United States,” Kulachol said. Kulachol previously received two additional honorary degrees from Ohio University and Fairleigh Dickinson University. Commencement is divided into three ceremonies. Kulachol will receive an honorary doctor of education leadership degree at the 1:30 p.m. commencement celebration. College of Education and Human Services. College of Applied Sciences and Arts. College of Mass Communication and Media Arts. For more information on the 2019 commencement, go to commencement.siu.edu.